Many out there may know that I have a nice lofty title at PLoS Biology. I am the Academic Editor in Chief there. With this title I get a lot of complaints about PLoS Biology. Alas, despite my lofty title, I do not actually run PLoS Biology. You see, PLoS Biology is a hybrid journal with both Professional editors and Academic Editors. The way it actually works is that the Professional Editors, under the direction of Theo Bloom, run the journal. As part of their running of the journal, they consult with Academic Editors (AEs) to get help in deciding if papers should be reviewed; if they are reviewed the AEs help suggest reviewers; and once reviews are back the AEs help in making decisions about the fate of the papers. They also consult AEs about a variety of other topics. In the end, you could view the AEs, including the AEIC (that is, me) - as having an advisory role at PLoS Biology. Generally, decisions are made in a collaborative manner with the AEs but in the end, it is the professionals who make the "final" decisions regarding the journal. But they do listen when I tell them about what the community likes and dislikes about PLoS Biology. I WANT YOUR COMMENTS ABOUT PLOS BIOLOGY. What new things would you like to see? Well, this is annoying. I recently published a paper in Nature for which I was senior and corresponding author on "A phylogeny driven genomic encyclopedia of bacteria and archaea." Though I did not want to submit it to Nature, the project involved a large large large number of other people and in fairness to their contribution to the project I agreed to submit it to Nature. 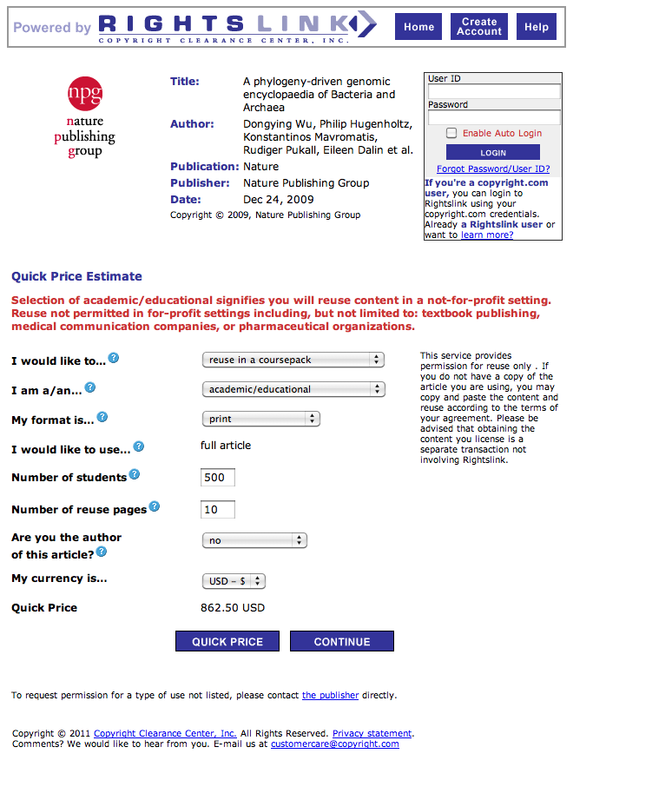 However, the reason I agreed in the end was that Nature said they would use their Genome Paper open license for it. For papers reporting genome sequence data, Nature claims to make the papers available at no charge and supposedly uses a Creative Commons license for publishing the paper. In addition, I note, that as the work was done my many US Government employees, we did not sign over Copyright to Nature. "This article is distributed under the terms of the Creative Commons Attribution-Non-Commercial-Share Alike licence (http://creativecommons.org/licenses/by-nc-sa/3.0/), which permits distribution, and reproduction in any medium, provided the original author and source are credited. This licence does not permit commercial exploitation, and derivative works must be licensed under the same or similar licence." Other than the strange spelling of license, this seems good. However, Nature's machine seems to not be set up to make the copyright/license issues clear in every place/way. 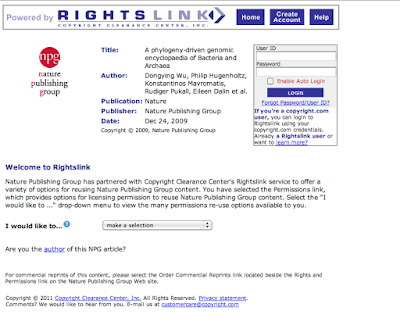 For example: if you go to the Nature site for my paper, it seems Nature is now claiming Copyright for the paper. For example see the PDF here. I suppose you could say that this all could be part of the Nature publishing machine just making a mistake here or there. In fact, I would bet that this is in essence what has happened. The system is designed for articles for which Nature holds the Copyright and has the rights to sell. And the papers that do not follow that model get caught up in the machinery. Nevertheless, it is annoying. And it makes me worry a bit about what is going to happen with Nature's new supposedly "open access" journal "Scientific Reports" which actually is not quite as open as it might seem. (The journal uses a somewhat restrictive Creative Commons license which does not fit the standard definition of "Open Access"). This seems to be YARFOA - Yet another reason for (full) open access. If you set something free, even if someone claimed they had rights to it, it would seem more obvious to everyone out there that such a claim would be inappropriate. I note in this section he says "The most exciting new open-data platform in 2010 was BioTorrents from Morgan Langille and Jonathan Eisen, a P2P data-sharing service for biology using BitTorrent. Something like this will be needed in every field where researchers need to share not just megabytes or gigabytes, but terabytes and petabytes." That made my month - see our PLoS One paper on it here. Modeling selective pressures on phytoplankton in the global ocean. Short RNA half-lives in the slow-growing marine cyanobacterium Prochlorococcus. Modeling the fitness consequences of a cyanophage-encoded photosynthesis gene. The challenge of regulation in a minimal photoautotroph: non-coding RNAs in Prochlorococcus. Patterns and implications of gene gain and loss in the evolution of Prochlorococcus. Prevalence and evolution of core photosystem II genes in marine cyanobacterial viruses and their hosts. PhylOTU: A High-Throughput Procedure Quantifies Microbial Community Diversity and Resolves Novel Taxa from Metagenomic Data (doi:10.1371/journal.pcbi.1001061). The paper discusses a new software program "phylOTU" which is for phylogenetic-based identification of "operational taxonomic units", which are also known as OTUs. What are OTUs? They are basically clusters of closely related sequences that are used to represent something akin to a species. OTUs are used a lot in environmental microbiology b/c one key way to study microbes in the environment is through extraction and sequencing of DNA. Traditionally this has been done through PCR amplification and sequencing of one particular gene (ss-rRNA). Now it is also being done through random sequencing of all DNA from environmental samples (so called metagenomics). Anyway - the paper is (of course) fully open access and you can read it for more detail. Just thought I would post a little here about it. The paper / project was led by Tom Sharpton, a post doc in Katie Pollard's lab at UCSF working on a collaborative project between Katie's lab, my lab, and Jessica Green's lab at U. Oregon (and recently Martin Wu's new lab at U. Virginia - he was in my lab previously). This collaborative project even has a name "iSEEM" which stands for integrating statistical, evolutionary and ecological approaches to metagenomics. This project has been generously supported by the Gordon and Betty Moore Foundation (via a grant for which I am PI). Just another mini-post here. I find it very very interesting that some serious museums out there are looking to start up "microbiology" curator positions. The latest is the American Museum of Natural History (see job posting here Assistant Curator and Professor of Microbial Systematics : Central Park West at 79th St., New York, NY 10024 : Naturejobs). And recently, the California Academy of Sciences has been interested in hiring a microbiologist too (see recent ad here). All I can say is - about time - after all - microbes kind of run the planet and represent the bast majority of the phylogenetic and biological diversity. There is a new article in Science Now reporting "Quandary: Scientists Prefer Reading Over Publishing 'Open Access' Papers - ScienceInsider". It discusses a new report from the SOAP (study of open access publishing) project. The reports coming from SOAP are very important and can be very useful. That is not what drives me crazy here. What drives me crazy is that this article and an almost uncountable number of other articles and discussions I see about "open access" publishing throw around the term "open access" inappropriately. This term is now used for basically any of the diverse array of array of journals or articles within journals for which there is no charge to read (the articles). The problem here is that the term "open access" really should be reserved for material that for which the term "free" applies not just to how much you pay for it (i.e., free of charge, like free beer) but "free" as in "freedom" (i.e., Braveheart free or Statue of Liberty free). Here is a good definition of "open access" from Peter Suber "Open-access (OA) literature is digital, online, free of charge, and free of most copyright and licensing restrictions." To me, more important the "free of charge" is "free of most copyright and licensing restrictions". This aspect of open access frees up the scientific literature to be reused and redistributed by anyone and has the potential to truly revolutionize scientific knowledge. Free of restrictions allows material to be used in textbooks and web resources (e.g., PLoS Hubs) and databases, remixed and remashed and whatever. No restrictions allows bloggers and other writers to take figures and post them and reuse them and spread knowledge. Free of charge simply allows people to read the paper at no cost - useful - important - but not all that "open access" is about. If you want to learn more about the difference between "open access" and "no charge to access" the best place to look is Peter Suber's "Open Access Overview." And please, don't fall for all these new journals calling themselves "open access" when all they do is make material available for no charge. Look at the restrictions the journals place on use of the material. What is the license used for the article? Does it allow any type of reuse or are there commercial or other restrictions? What is the copyright policy? And so on. In other words, just how "open" are they really? Nature new PLoS One like journal "Scientific Reports"
Wow - sounds remarkably like PLoS One, even though they do not mention PLoS One in the announcement. Good news all around I think - the more OA we have out there the better. H/T to Tom Sharpton and Katie Pollard for pointing this out.